– Follow up on users recommendations of locations. This last walk about should sum up all the recycling work to be done for a long time. In future, it should just be small reminders of aligning the bins and bins for new buildings. Learning from previous experiences, this time as we look at introducing another new recycling initiative, we not only involved the OED supervisors who managed the housekeeping companies but also the housekeeping companies supervisors themselves! Back to the story, anyway, after our success in recycling raising the paper, plastic and cans recycling from 60 tonnes in AY 08/09 to 320 tonnes in A 10/11. There is a new challenge to tackle the source of paper in offices: Something like this that is practised in Yale as well as Republic Polytechnic. a.	Housekeepers clear our trash bin twice a day. Set aside one session of a day of the week where the housekeepers clear the paper recycling receptacles but not the trash bins. a. Note: most of the housekeepers are elderly. 3. Have staff to clear the small paper recycling receptacles themselves. a. Issue every staff with a small paper recycling receptacle and put up more big paper recycling boxes. I though that option 1 was the best option as it didn’t increase the workload of the housekeepers. To my surprise, they totally rejected option 1. 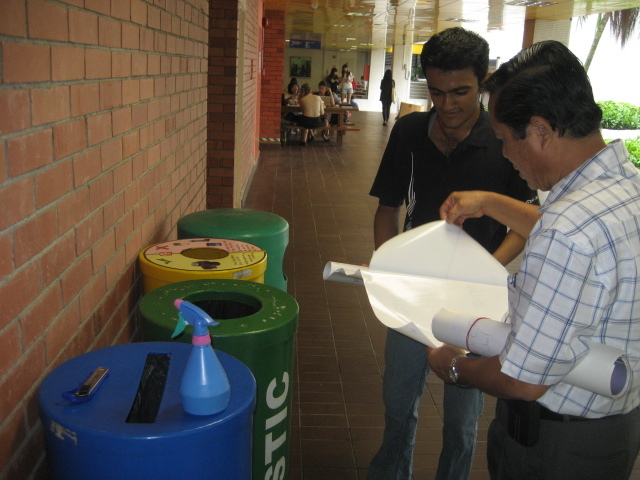 They felt that users would not understand and will still request them to clear rubbish bin if there was food waste. I am just so glad to have involved them in the discussion! 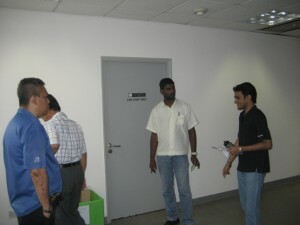 Our intern Rama spotted at Block E1 and Block E1A on 12-07-2011 that trash bins were placed inside the paper recycling boxes. The paper recycling boxes were issued as part of an initiative between FOE and OES to facilitate staff to recycle. Apparently after some time, someone or the housekeeping has ignored such an initiative and simply used the paper recycling boxes as an additional base for the trash bin! Now, this case has been brought to attention and rectified. The worry is now that because the housekeepers were not bought into the inititative, they will clear the contents of both receptacles as general waste even though the paper recyclables and general waste are segregated into the different receptacles! How to prevent recycling bins from Spinning!!! A common issue we have on campus is bins spinning. Yes the body of the bin get turned around and does not face the user. When the bin does not face the user, the user will have no idea what type of recycling bins these are. Similarly, the cover get turns around and the wording does not face the user again. Spotted at Changi Airport where image is important and they are willing to spend the money. Letter to Subway to encourage them not to give plastic bags mindlessly. Having a Subway outlet at Yusof Ishak House (YIH) is really a blessing to many of the staff and students of National University of Singapore. Perhaps, the YIH Subway may like to consider the following to make your operations even better! I noticed that YIH Subway give out plastic bag for every customer. Perhaps this is because it is not a sit in operations like other Subways where customers can use their own trays. However, many of the customers do consume their Subs in the sitting area right outside the YIH Subway. This meant that lots of Subway customers used the plastic bags for a distance of less than 5 m before throwing it away. This is just such an awful waste. Perhaps, the YIH Subway staff would like to ask every customer if they need a plastic bag before giving one or perhaps YIH Subway can leave the plastic bags outside for customers to take themselves just like how we help ourselves to serviettes. I can really see how this can cuts that Subway operating cost, effectively saving money for subway while saving the planet at the same time. I will really love to have a healthy planet along with a healthly meal at the same time! UTown Site office paper recycling bin doing well!! It is so full and cartons so well flattened! As Ridge View Residences did not have its own bin centres, it becomes an challenge when their residents move out. Thus now we set a temporary location to collect recyclables so that Veolia can come and pick it up directly. Being located at Ridge View itself, it will also facilitate the housekeeping staff to recycle. Finally a successful recycling stakeout!!! For weeks, I have been hiding near recycling bins on Tuesday or Thursday morning to observe housekeepers at work clearing the recycling bins. 24th May 11.57am, I secretly followed housekeeper Alice and her male staff who was clearing the recycling bins at the central forum. After they have deposited the collected recyclables at the Central Library Bin Center, I went to check out the recycling bulk bins. What happened was the recyclables are not segregated into the 2 different coloured bulk bins but all combined into one big trash bag and then just deposited into one of the recycling bulk bin. We were often worried that cans are pilfered but as the above photos show: our housekeepers ( at least of Zone 2) have been diligent in collecting the cans. – This is just one stakeout, it may not be representative of the other zones. – Theoretically, there is no issue with the above mentioned method as Veolia still sorts out the recyclables. The paper and plastic/cans are in seperate bags and hence there is no issue of contamination of paper meant for recycling. Also being in seperate bags, it will still facilitate Veolia later in their sorting. – It is still good for users to sort so that paper don’t get contaminated by plastic/cans and seperate bags makes the final sorting easier for Veolia. – However, there is then no need for seperate coloured bulk bins? – If we feel that it is worth our time and effort to solve this issue, one consideration will be to provide special bags/ containers for the housekeepers to collect the paper and the plastic/cans. When it is seperated in the process of collection. It will faciliate the final disposal as well. Another round of PGP Charitable Recycling! After the Campuswide Charitable Recycling, another round of PGP Charitable Recycling was held in early May. Thanks to the joint effort of 0Waste committee members, PGP Resident Assistants and NUSSU SAVE main committee, OES and all the supporting students and staff from PGP, the event was another big success! Within 11 days, we have collected 454kg of used clothes, almost trippled the amount of the previous PGP Charitable recycling! We should always remember the hard work behind the success of the event and keep it up! It was cool to see that Khoo Teck Huat Hospital is pairing their recycling bins with their trash bin! Wonder who gave them that idea!